I can't see the logic in the name Peony Basket for this quilt block, but then I was not the person who chose the name. 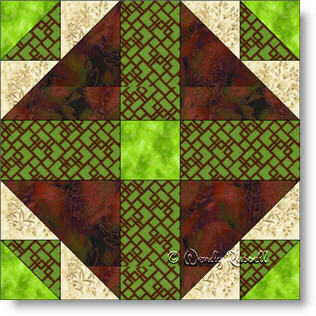 So, that being said, this is a easy quilt block to make and perfect for those quilters who like 10" blocks. The components of this block are squares, rectangles and half square triangles -- all very common units and easy to work with. Even though this quilt block is sewn together as an uneven nine patch, it is created on a five patch grid, and so I have included it in that category as well. The two sample quilts illustrated show that even though this block might not have a 'masculine' name, by selecting darker colours, the man in your life will love this quilt.